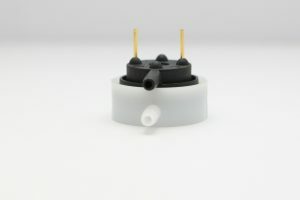 Miniature single pole and double pole switches, used as air switches in combination with Presair actuators. Momentary action. Rating: 1 Amp Resistive, 120/240 VAC; UL recognized for 100,000 operations. Material: Rynite/acetal body, silicon diaphragm, gold pins and contacts, stainless steel springs and screws. Miniature single pole and double pole switches used as pressure switches where moderate accuracy is sufficient. Pressure ranges: 6 IN.W.G. to 65 PSIG. Pressure setting marked on switch in inches water gauge. Actuation point is customer specified and set at the Presair factory. Some models allow field adjustment. Rating: 1 AMP resistive @ 250 VAC. Ratings are dependent on actuation pressure and must be de-rated at lower pressures. UL recognized for 100,000 operations. Miniature single pole and double pole switches used as vacuum switches where moderate accuracy is sufficient. Vacuum ranges: 6 IN.W.G. to 200 W.G. Vacuum setting marked on switch in inches water gauge. Actuation point is customer specified and set at the Presair factory. Some models allow field adjustment.